John F. Raffensperger, 10 May 2017. If you're interested in smart markets for the environment, please let me know! Write to me at john dot raffensperger at gmail dot com. This note is an annotated bibliography of my work on smart markets for hydrological resources. Some of this work is refereed journal articles, some presentations, some project reports, some notes, and some papers in draft. About the year 2002, my colleague Grant Read began teaching me about electricity markets. He had been leading the Electricity Market Research Group for many years. Eventually, I got to where I could teach the material. The theory and practice on electricity markets (e.g., Schweppe et al 1988) are far ahead of the theory and practice on water markets. In July 2004, on a plane over the Atlantic, I conceived of a smart market for groundwater, analogous to the smart market for electricity. (I thought at the time that a smart market for surface water was almost trivial.) I wrote it out on a paper napkin or a paper placemat, I forget. Months later, I found that Murphy et al (2000) had already thought of using smart markets for water. They developed simple models for experimental economics, and did not develop a full market design, nor did they develop the complicated models required for a real water market. But they seem to be the first to think of this idea, and would have been working on it for years before this was published. My colleague Mark Milke taught me much about water (for example, it flows down hill, LOL!). With Grant serving as our market design expert and with Mark as the hydrology expert, we collaborated with students to develop smart market designs for a range of hydrological resources. Since then, I have learned a lot more about smart markets in general. Much is happening in auctions for radio spectrum, transportation, natural gas, and even organ transplants. I have even had the privilege of teaching a course on smart markets with my current employer. 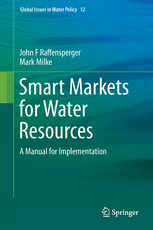 Raffensperger, John F., and Mark Milke, Smart Markets for Water Resources: A Manual for Implementation, Springer Publishing, May 2017. This books explains why water markets work so badly, and proposes an elegant solution - the smart market. The book describes the prerequisites that must be in place before the market can begin. It describes in detail how the market would be structured and how it would operate, for different types of hydrology. It has a chapter on common objections to water markets. It even has as appendix that describes the layout of the market operator's databases. If you're interested in water allocation or water markets, you would benefit from reading this book. We thought that people would want to know about the smart market approach, so back in 2005 we began a road show of sorts. But it’s much harder to implement than I expected. Raffensperger, John F., and Mark Milke, “National Workshop on Consent Trading: New Options for New Zealand,” NZHS-IAH-NZSSS Auckland 2005 Conference, 28 Nov 2005. In an all-day workshop, we invited the audience to play a trading game, simulating a water market. Raffensperger, John F., and Mark Milke, “Trading of consented groundwater allocations via auctions,” Auckland: NZHS-IAH-NZSSS Auckland 2005 Conference, 28 Nov - 2 Dec 2005. • Tasman District Council, to staff, farmers, farm industry reps, irrigation associations, councillors, ministerial representatives, and Maori, 23-5-2005. • Hawkes Bay Regional Council, staff and councillors, 24-8-2005. • Environment Waikato, to staff, farmers, farm & irrigation reps, councillors, & Maori, 3-11-2005. • Canterbury Federated Farmers regional presidents, 21-11-2005. • Marlborough District Council staff, 6-12-2005. • Environment Canterbury senior staff, 7-12-2005. So we worked hard at showing this around, but never got much traction. Raffensperger, John F. and Milke, Mark, The Forever Fair Consent Trading System: Analysis of On-Line Auctions for Groundwater, grant report to the NZ Hydrological Society, 2005. The NZ Hydrological Society provided our first funding, for which I am truly grateful! Raffensperger, John F., Milke, Mark., “A Design for a Fresh Water Spot Market,” Water Science & Technology: Water Supply, 5(6), 217-224, 2005. This paper shows screenshots of the database that we developed. Raffensperger, John F., and Mark Milke, “How to Solve Our Water Crisis: a Demo Spot Market for Ground Water,” 23 May 2006, MODFLOW and More 2006 Conference, International Ground Water Modeling Center, Colorado School of Mines, Colorado. Raffensperger, John F., “A tutorial on hydrogeological optimisation,” ORSNZ Conference, Christchurch, NZ, Nov 2006. I took most of that from from Greenwald, R. (1998), MODMAN: An optimization module for MODFLOW Version 4.0, GeoTrans, 2 Paragon Way, Freehold, New Jersey 07728, pp. 6-1 to 6-8. Plagmann, Manfred, and Raffensperger, John F., “A Smart Market for Ground Water using the Eigenmodel Approach,”MODSIM Conference 2007, Christchurch NZ. From a Selwyn District Council grant for an MBA project, 2006-2007. This work was Manfred’s MBA project. It examined the possibility of running a smart market for groundwater in the Selwyn District. The resulting diagrams are compelling – the market mechanism gives detailed spatial and temporal pricing. Raffensperger, John F., “Smart Markets - the Answer to Australia’s Water Crisis,” Conference of the Australian Society for Operations Research, 3-5 Dec 2007, Melbourne, Australia. Raffensperger, John F., Jin Lin, and Chunmiao Zheng, “Planning a smart market for Tianqiao groundwater,” 2010, draft paper. We tested the market-clearing mechanism for Chinese groundwater from a technical viewpoint. Raffensperger, John F., “Matching Users’ Rights to Available Ground Water with a Smart Market,” 2nd International Conference on Water Economics, Statistics & Finance, Alexandroupolis, Greece, 3–5 July 2009. Raffensperger, John F., “A Smart Market for Ground & Surface Water,” English and Chinese, given at (1) Peking Univ. Center for Water Research, Beijing, 22 June 2010, and (2) Chinese Univ. of Geosciences, Wuhan, 2 July 2010. My friend Yongliang Bai invited me to visit him in Wuhan. What an honor to be invited! He and his colleagues treated my wife and I wonderfully. I began the translation using Google Translate, and then my Chinese colleagues helped me improve it. Raffensperger, John F., “The Forever Fair Water Consent Trading System,” invited presentation, NZ Fresh Water Management Forum, 15-16 Feb 2010, Wellington, New Zealand. I developed an improved version of our water market game. People could participate with their cell phones, and see the results on screen. When they don’t make mistakes (! ), participants see that everyone wins, and the environment is protected. Teasley, Rebecca, John Raffensperger, and Mark Milke, “A Smart Market for Ground and Surface Water with Hydropower Generation,” ASCE World Environmental and Water Resources Congress, 16-20 May 2010, Providence, Rhode Island. An interesting example in which we thought a reservoir operator would have significant market power. It doesn’t look like they would, in our example, because the reservoir operator must release water to meet its generation commitments, and because the aquifer provides some storage. GW 2010. Teasley, Rebecca, Mark Milke, John Raffensperger, Marieh Zargar, “Common Pool Water Markets and Their Role in Facilitating Land Use Change in Drying Climates,” poster presentation, American Geophysical Union, Fall Meeting, 13-17 Dec 2010, San Francisco. GW 2010. Zargar, Marieh, Rebecca Teasley, Mark Milke, John F. Raffensperger, “Varying Water User Demand Curves in a Groundwater Smart Market,” NZ Hydrological Soc. Conf., Dunedin, NZ, 6-10 Dec 2010. • 8 & 23 Sep 2011, Mgmt Engg Dept and Env Engg Dept., Denmark Technical University. • 27 Sep 2011, Dept. for Environment, Food and Rural Affairs, UK, at Univ. College London. • 17 Dec 2011, Division of Humanities & Social Sciences, California Institute of Technology. Raffensperger, John F., “Matching Users’ Rights to Available Ground Water,” Ecological Economics, v70, n6, pp.1041–1050, http://dx.doi.org/10.1016/j.ecolecon.2011.01.015, 15 April 2011. This major paper shows how users’ rights can be adjusted to ensure that the market manager has revenue neutrality. If users’ rights are under-allocated, then the manager is selling water. If users’ rights are over-allocated, then the manager must buy rights from users to make sure the environmental flows are satisfied. How can the rights and water be balanced for a complicated groundwater system? This papers shows how. Raffensperger, John F., Mark W. Milke, and E. Grant Read, “A Deterministic Smart Market Model for Ground Water,” Operations Research, v57, n6, Nov-Dec 2009, pp. 1333-1346. Winner best paper prize, INFORMS ENRE section, 13 Nov 2011. This major paper explains the market design for groundwater in detail. Developed a smart market model for Horizons Regional Council, supported by AgResearch. TrustPower, outlined a water market for the Rangitata Diversion Race, with Grant Read. Raffensperger, John F., “How water markets will reduce risk and drive infrastructure investment,” invited presentation, Water Infrastructure Investment & Planning Conference, 27-28 June 2011, Wellington, NZ. I gave the same presentation again on the same day to the Ministry of Agriculture and Forestry, Wellington, NZ. Starkey, S.R., S. Dye, E.G. Read, J.F. Raffensperger, and B.J. Ring, “Enhancing Urban Water Allocation: An Evolving Framework for Trading Stochastically,”19th Triennial IFORS Conference, Melbourne, Australia, 10-15 July 2011. Users want certainty of supply, but that is impossible since inflows are unknown. How can we design a market mechanism for uncertain inflows? See other papers on stochastic water markets on Grant Read's EMRG page, such as Starkey, Dye, Read & Read, "Stochastic vs. Deterministic Water Market Design: Some Experimental Results." Lumbroso, D. M., C. Twigger-Ross, J. Raffensperger, J. J. Harou, M. Silcock, A. J. K. Thompson, "Stakeholders’ Responses to the Use of Innovative Water Trading Systems in East Anglia, England," Water Resources Management, July 2014, Volume 28, Issue 9, pp 2677-2694. In this major project, we developed a smart market design for surface water, including reservoirs and non-consumptive water use, among other things. We tested the market design with real water users. See also "Research into Water Allocation Through Effective Water Trading, Phase I - Stakeholder Engagement," and "Phase 2 final report, Research into Water Allocation Through Effective Water Trading." My role in this project was to develop the common pool market design, develop the hydrological optimization, build a trading web site for users to try the market as a game, and then to manage the market demonstrations. To my knowledge, this was the first time that a smart market for water was tested with the actual users. Another output from this is Erfani, Tohid, Olga Binions, and Julien J Harou, "Simulating water markets with transaction costs," Water Resour Res. 2014 Jun; 50(6): 4726–4745. Raffensperger, John F., and Darren Lumbroso, “Notes on a UK water market demo,” ORNSZ Conference 2012, Wellington, New Zealand, 3-4 Dec 2012. People who attended this presentation got to admire my market web page. Ranga Prabodanie came to New Zealand, and completed a PhD with the Water Markets Research Group, studying market designs for nitrate runoff. Prabodanie, Ranga, and Raffensperger, John F., “Cleaning the Water: a Smart Market for Nitrates,” MODSIM Conference 2007, Christchurch NZ. An early presentation of a market design for nitrates, mainly runoff from agriculture. Raffensperger, John F., and Mark Milke, “Nutrient trading in Lake Taupo: getting it right,” National Business Review, 14 Mar 2008, p. 49. Prabodanie, R. A. Ranga, and Raffensperger, John F., “Can Markets in Agricultural Discharge Permits be Competitive?” ORNSZ Conference 2009, Christchurch, New Zealand, 3-4 Dec 2009, pp. 182-189. Prabodanie, R. A. Ranga, John F. Raffensperger, and Mark W. Milke, “Simulation-Optimization Approach for Trading Point and Non-point Source Nutrient Permits,” 18th World IMACS/MODSIM Congress, Cairns, Australia 13-17 July 2009. Prabodanie, Ranga, John F. Raffensperger, and Mark Milke, “A Pollution Offset System for Trading Non-point Source Water Pollution Permits,” J. of Env. and Resource Economics, 2010, v. 45. n. 4, pp. 499-515. Prabodanie, R. A. Ranga, John F. Raffensperger, E. Grant Read and Mark W. Milke, “LP models for pricing diffuse nitrate discharge permits,” Annals of Ops. Res., DOI: 10.1007/s10479-011-0941-0, Aug 2011. An important work. Kostel et al, "Feasibility Assessment of a Nutrient Trading Market in the Big Bureau Creek Watershed Final Report," September 2014, Prepared for U.S. Environmental Protection Agency, Targeted Watershed Grant WS-00E71101. This major collaboration, with at least 16 people working on it, developed full hydrological and economic analyses, with a proposed legal framework. Ranga Prabodanie and I co-wrote Chapter 5 on the Marshwren market design, and significant parts of Chapter 2, generally following our 2011 market design, but with an important extension. We demonstrated that a market for nitrate and phosporus runoff could incentive construction of wetlands. Based on recent operations research work, we developed a pricing mechanism for the discrete wetlands investment. I think this is the state of the art in nutrient trading as of this writing. Pinto, Antonio, Thomas A. Cochrane, and John F. Raffensperger, “Smart Markets and Improved Management of Sediment Discharge,” Technical Report for Auckland Regional Council, 2008. My colleague Tom Cochrane suggested that the smart market could apply to sediment. With funding from Auckland Regional Council, Antonio Pinto gave it a look. The answer, of course, is yes. Pinto, Antonio, Thomas Cochrane, John F. Raffensperger, “A Proposed Smart Market for Sediment Discharge,” ORSNZ Conference, Victoria University, Wellington, NZ, 24-25 Nov 2008. Pinto, Antonio, John F. Raffensperger, Thomas Cochrane, and Shane Dye, “A Proposed Smart Market for Impervious Cover Runoff under Rainfall Uncertainty,” Proceedings of the ORNSZ Conference 2009, Christchurch, New Zealand, 3-4 Dec 2009, pp. 190-199. Following the success of the design for sediment, Antonio began a PhD studying impervious cover. Raffensperger, John F., and Thomas Cochrane, “A Smart Market for Impervious Cover,” Water Resources Management, v. 24, no. 12, pp. 3065-3083, http://dx.doi.org/10.1007/s11269-010-9595-y, Sep 2010. Quite an important paper! Tom and I worked developed a market design based on a deterministic market-clearing optimization, treating a stream's capacity as the market-driving constraint. Antonio furthered this work, with a stochastic market-clearing optimization. Pinto, A.A., Raffensperger, J.F., Cochrane, T.A. and Read, E.G., "A proposed smart market design for sediment discharge," Journal of Water Resources Planning and Management, 139(1): 96-108, 2013. Pinto, A., Raffensperger, J.F., Cochrane, T.A., Dye, S. and Read, E.G., "Propuesta de un modelo de mercado restringido 'Smart Market' para usos del suelo considerando lluvias inciertas," Universidad de Concepción, Concepción, Chile: X Congreso del Instituto Chileno de Investigación Operativa Optima 2013 VI Red-M, 27-30 Oct 2013. Raffensperger, John F., “The minimum data required to allocate water,” NZ Hydrological Society Conference 2006, Christchurch, NZ, Nov 2006. Raffensperger, John F., “An operations research framework for water ethics,” invited presentation, PKU-UNESCO Int’l Symposium on Ethics of Water Resource Management, 6 Nov 2007, Beijing, China. Equity based on the dual of the market-clearing model (equal prices) results in higher welfare than equity based on the primal (equal quantities). Raffensperger, John F., “Generalized smart markets for water resources,” INFORMS Conference, Washington D.C., 12-16 Oct 2008. Putting it all together. Raffensperger, John F., “Water allocation & hydrological optimization,” invited lecture, Dept. of Civil Engineering, Michigan Technological University, 3 Oct 2008. Bai, Yongliang, and Raffensperger, John F., “A comparison of fresh water management in New Zealand and China,” draft paper. We examined how water is managed different in the two countries. Bottom line: the transaction costs raise similar problems. Raffensperger, John F., “PLOVER 2k: Planning Openings and Values for Ellesmere’s Resilience,” keynote presentation, Living Lakes Symposium 2, Lincoln University, Lincoln, New Zealand, 4 Nov 2009. The report PLOVER 2k: Planning Openings and Values for Ellesmere’s Resilience. See also "Te Waihora Lake Ellesmere – the 2009 Living Lake Symposium". Here are some of the scenarios that we examined. This was a fantastic project, an amazing simulation of one of New Zealand's great estuarine treasures. It was a true honor to be a part of it. As part of the project, I developed a detailed influence diagram, based on the appendices in Taylor, Kenneth, ed., The Natural Resources of Lake Ellesmere (Te Waihora) and Its Catchment, Canterbury Regional Council, 1996. Briefly, I scanned those tables, ran OCR, converted to Excel, edited, and created a graph structure, which I laid out with GraphViz. Sorry, folks, I don't have permission to post the amazing model. Raffensperger, John F., and Hughey, Kenneth, “Modelling Values of Lake Ellesmere,” ORNSZ Conference 2009, Christchurch, New Zealand, 3-4 Dec 2009, pp. 148-158. William, Gerard, Mark Milke, and John F. Raffensperger, “Survey of New Zealand Hydrologists on Water Policy and Information Needs,” NZ Journal of Hydrology, 48(1), pp. 1-12, 2009. Raffensperger, John F., "Notes on Net Versus Gross Pool Markets," 2009. I wrote this note for my students. Raffensperger, John F. and George, John, "A Touching Belief in the Market,Comment on 'A Derivative Approach to Endangered Species Conservation,'" unpublished. This paper critiques Mandel, James T., C. Josh Donlan, and Jonathan Armstrong, “A derivative approach to endangered species conservation,” Frontiers in Ecology and the Environment, Jan 2009. People can get confused about how markets work. Raffensperger, John F., “Outline of a market for ecological connectivity,” ORSNZ Conference, Auckland, NZ, 29-30 Nov 2010. On a visit to UCLA's Institute for the Environment and Sustainability, I learned a little about ecological connectivity. The loss of biodiversity (euphemism for "mass die-off) is so depressing! Here is a slightly improved version. CityWest, Ltd., Melbourne, Australia. Development of an integer programming model for planning a water recycling system. They presented this in Adelaide. I did much of the development on their MABAL optimization, as directed by Ian Monks.